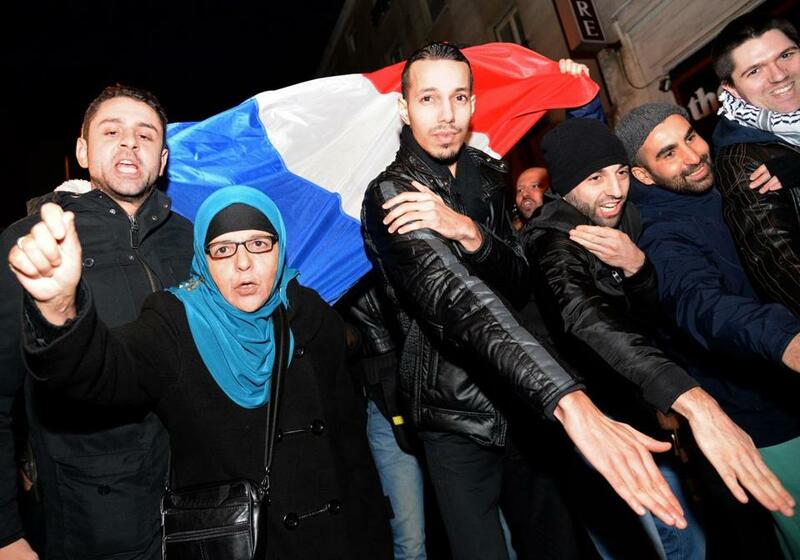 Supporters of French comedian Dieudonné M’Bala M’Bala performed “quenelle” hand gestures outside his theater last month in Paris. The gesture is gaining in popularity. PARIS — No one seems to know just what is meant by the “quenelle,” the vaguely menacing hand gesture invented and popularized by a French comedian widely criticized as anti-Semitic, but it is clearly nothing very nice, and it appears to be spreading. Fans of the performer, Dieudonné M’Bala M’Bala, send him photos of themselves making the gesture, known as the quenelle, in front of monuments, next to unwitting public officials, at weddings, and in class photographs, but also, increasingly, beside synagogues, Holocaust memorials, and street signs displaying the word “Jew.” At least one young man appears to have posed outside the grade school in Toulouse where, last year, four Jews were killed by a self-proclaimed operative of Al Qaeda. Jewish leaders, antiracism groups, and public officials have pointed out that the quenelle, which is also the name of a fish dumpling that is a French delicacy, strongly resembles a downward-facing Nazi salute. M’Bala M’Bala, who goes by Dieudonné, insists that it is nothing more than an “antisystem” joke for his initiates, most of them young men, some from the disaffected immigrant suburbs, some from the xenophobic far right. This autumn, military leaders discovered that the quenelle was popular with soldiers and the army chief of staff banned the gesture after two uniformed infantrymen were sanctioned for performing one outside a Paris synagogue. Last week, a top French soccer player, Nicolas Anelka, was widely criticized for performing a quenelle during a game. Anelka, like other French sports figures and celebrities seen performing the quenelle, said the gesture was not anti-Semitic. But authorities say they have watched the spread of the quenelle with increasing alarm. Jewish groups have pressed the government to act, although just what can be done is not clear: The traditional Nazi salute, for instance, is not expressly banned here, and any effort to ban the quenelle would raise questions of free speech. But state intervention in such matters is traditional here, with racist speech strongly restricted by law, and last week the interior minister, Manuel Valls, announced that he would attempt to ban the humorist from performing in France. Valls’s decision followed the broadcast of a video in which Dieudonné laments that a prominent Jewish journalist did not die in “the gas chambers.” Under French law, those words will likely be deemed “incitement to racial hatred.” Dieudonné’s lawyer said they could earn his client fines. It is far less clear, however, if there is a legal basis for an outright ban on his shows.